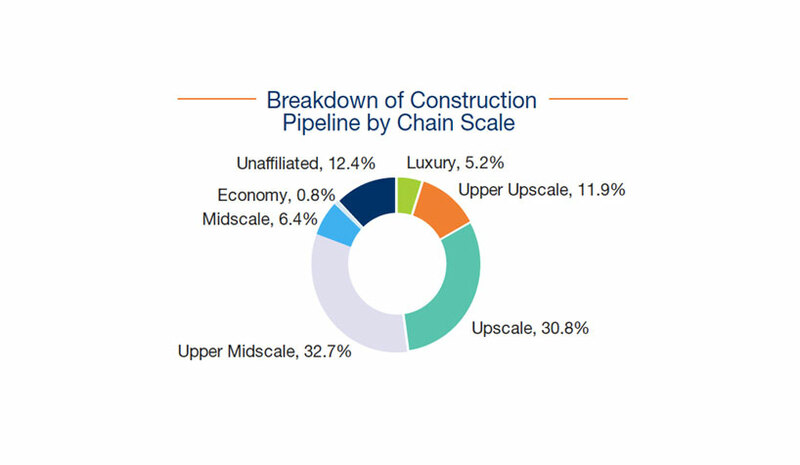 Upscale and upper-midscale are dominating the construction pipeline, according to Marcus & Millichap's Q2 2018 hospitality report. CALABASAS, CA—A new reported published by Marcus & Millichap revealed that economic momentum is pushing the hospitality in the right direction. Hotel sector on track for exceptional room demand. Healthy employment growth and increased consumer spending continue to drive hotel performance nationwide. Occupancy rose to a 30-year high in March, driving increases in ADR and RevPAR. The trend will continue as the stimulative effects of the new tax laws drive economic growth and unemployment remains low. Several markets with large development pipelines, however, may face supply pressures, reducing occupancy and slowing RevPAR growth. Record consumer and business confidence levels support expectations of strong consumption and business spending this year. These rising confidence levels will likely buoy room demand through the remainder of the year, keeping occupancy at a historical high. A healthy pace of hiring, rising wages and a low unemployment rate are underpinning strong summer travel expectations, with travel associations expecting travel expenditures to increase by 5% this year. Rising expenditures will bode well for hotel occupancy, ADR and RevPAR. The accelerating economy and improving property performance metrics have boosted supply additions in many markets, like Nashville, TN, which may begin to weigh on occupancy improvement. The metro has more than 5,200 rooms underway, about 12% of its existing room inventory. Increased supply has outpaced room nights, with occupancy falling 60 basis points during the past 12 months. Bidding heats up for hotels in smaller markets. Improving occupancy and revenue growth are underpinning demand for hotel properties. Transaction velocity rose roughly 2% nationwide as demand picked up for properties in many of the nation’s smaller markets. Private investors accounted for more than half of sales volume, with buyers in the $1 million to $10 million price tranche particularly active. The share of private investors competing for hotel properties has increased steadily since 2014. Trades picked up considerably in upper-upscale hotel properties, with the number of sales rising approximately 30% during the year ending in the first quarter. Hilton- and Marriott-branded hotels comprised the majority of transactions. Upper-upscale hotels changed hands with average first-year returns in the high 7% band during the past 12 months. The Northwest region posted a significant jump in the number of sales, led by increased transactions in Idaho and Montana. Many of these buyers are owner-operators purchasing hotels with fewer than 100 rooms. The state of Georgia also garnered significant investor attention. Buyers primarily targeted the Atlanta metro, where revenue growth above the national average persists. Independent properties remain a popular target, particularly as consumer demand for unique experiences evolves. Limited listings spurred competition for these assets, lifting the average price up 6% during the past four quarters to $155,100 per room in March. 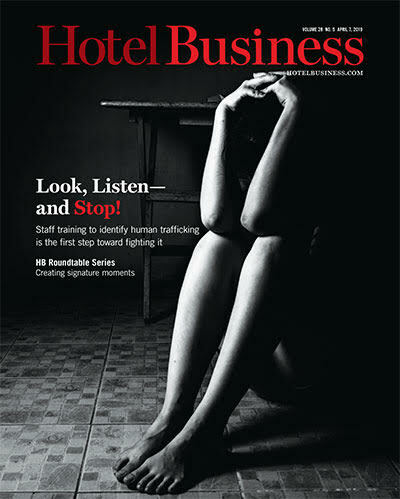 Limited-service hotels drive construction. Nearly 200,000 rooms were completed during the year ending in March, across 993 hotel projects. Moving forward, more than 186,000 rooms are underway and an additional 221,000 rooms are in the final planning stages and are expected to break ground throughout the next 12 months. Marriott International and Hilton continue to lead supply additions nationwide. The Marriott brand will comprise 31.5% of new rooms, while Hilton will account for 26% of new rooms. New York has the largest construction pipeline among the major metros, with nearly 12,000 rooms under development. More than 5,600 rooms were completed in the year ending in the first quarter, with upper-upscale and unaffiliated hotels leading supply additions. Among chain scales, the bulk of new completions were in the upscale and upper-midscale segments, with a combined total of 79,000 rooms during the past 12 months. Room demand drives increases in revenue metrics. Rising occupancy is underpinning growth in ADR and RevPAR. The average daily rate climbed 2.1% during the past 12 months to $127.36 while RevPAR rose 2.9% during this same time to $84.17. Record tourism in Florida helped drive occupancy improvement in many of the state’s major metros. Orlando in particular posted a 420 basis point increase during the past four quarters to 80%. The Orlando International Airport posted a 7% increase in passengers during this same time. The majority of chain scales posted occupancy increases during the previous 12-month period. Independent properties led the way, with an 80-basis point year-over-year increase to 62.9%. Luxury hotels also fared well, with a 60-basis-point increase during this same time to 74.4%, the highest occupancy rate among chain scales. Demand picked up considerably for resorts. Occupancy in these hotels jumped 130 basis points during the prior 12-month period to 69.9%. First-quarter occupancy rose 100 basis points from the same time last year to 70.2%. Strong first quarter aids annual occupancy increase. First-quarter occupancy rose 60 basis points from the same time period last year, to 61.1%. The increase helped boost annual occupancy roughly 50 basis points during the past 12 months, to 66.1%. Fed raises benchmark interest rate, plots path for additional increases. The Federal Reserve increased the federal funds rate by 25 basis points, lifting the overnight lending rate to 1.75%. The Fed noted that inflation has reached its target range, while the domestic economy is performing well as tax cuts power household spending and corporate investment. As a result, the Fed has guided toward two additional rate hikes this year, likely in September and December, while setting the stage for as many as four increases in 2019. Lending costs rise alongside Fed rate increase. As the Fed continues to lift interest rates, lenders are increasingly tightening margins in order to compete for loan demand. Despite these efforts, borrowing costs remain on an upward trajectory, which may prompt investors to seek higher cap rates or pursue greater returns in secondary markets. However, robust economic growth and rising net operating incomes are keeping selling prices elevated, which may widen an expectation gap as property performance and demand trends remain positive. Hotel lenders reduce credit spreads; construction lending remains limited. A wide range of capital remains available in the hotel sector, with lenders reducing credit spreads to stay competitive. In general, underwriters are taking a disciplined approach, developing an understanding of the market and being stringent on credit standards. Additionally, construction lending remains conservative, which could benefit occupancy improvement in the long run as fewer projects enter the construction pipeline.